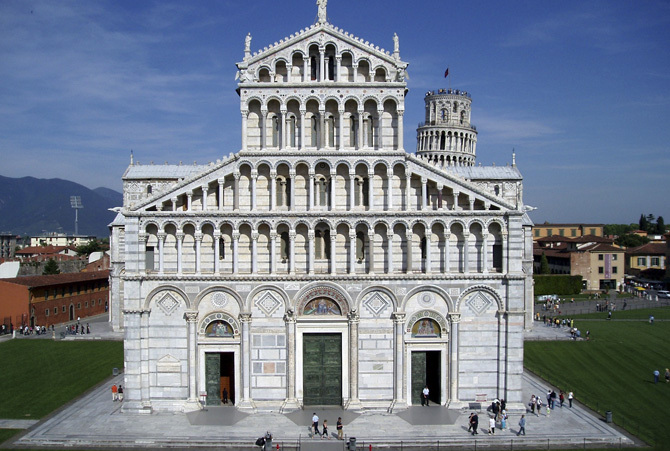 The Cathedral of Pisa, the church of Santa Maria dell’Assunta, has become a concrete statement of the immense power and wealth of the maritime Pisan Republic during mediaeval times. The decorations on the façade and the side walls show elements of sculpture, architecture and painting which exhibit Byzantine, Romanesque, Lombard and Arabic influences: a wonderful synthesis which led to the birth of the Pisan School of art which is quite unique. 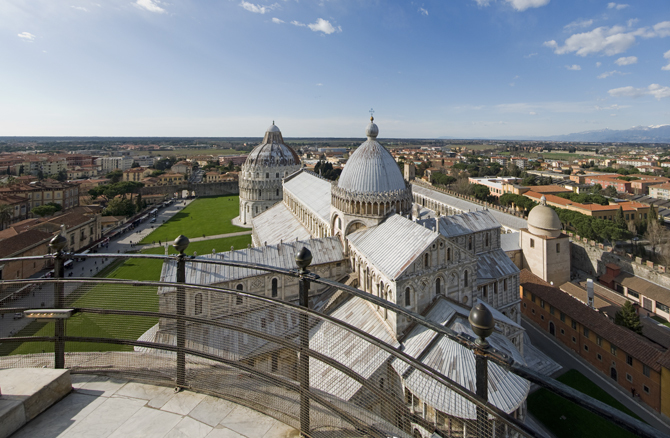 Work on the cathedral began in 1063 financed with the plunder from the war against Arabs in Sicily and at the same time it became the principal architectural rival to the new cathedral of St Mark’s in Venice, reflecting the commercial rivalry between the two republics. 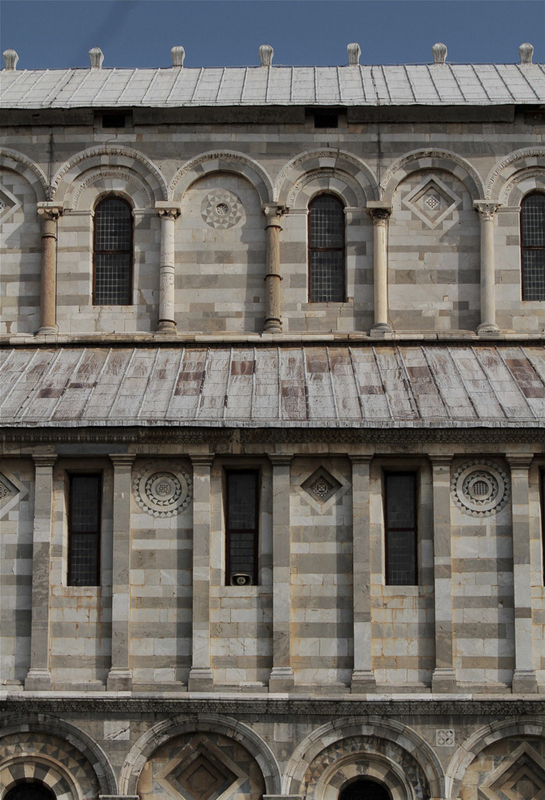 In contrast to the Venetian Cathedral which has domes on each branch of the cross as well as a main central dome, Pisa Cathedral has a single elliptic dome placed at the intersection of the transept and the nave. 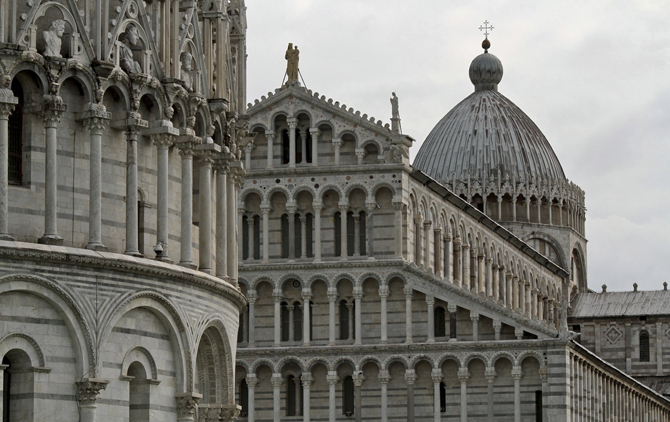 Designed by the architect Buscheto di Giovanni Giudice, the cathedral originally had the shape of a Greek cross with five naves which lead to the great eastern apse, and a three-naved transept with two small asps to the north and south. The double archways which separate the nave and the second level of the cathedral with its elegant balconies show a strong Byzantine influence. 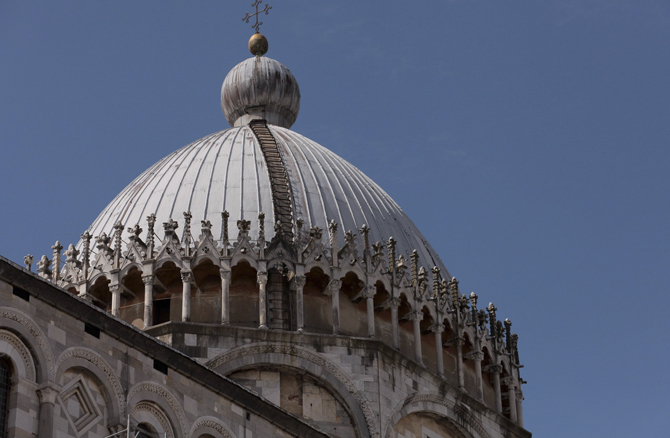 Later the architect Rainaldo extended the length of the cathedral transforming it from a Greek cross into a Latin cross. Rainaldo was also responsible for the magnificent western façade which is decorated with elaborate sculpted marble panels, columns and statues. Visitors are stunned by the splendour of the interior. The columns and the arcades are decorated with alternate strips of white and black marble recalling the mosques of Andalusia and providing harmony in this large airy space which is full of light and wonderful sculptures, carvings and mosaics. 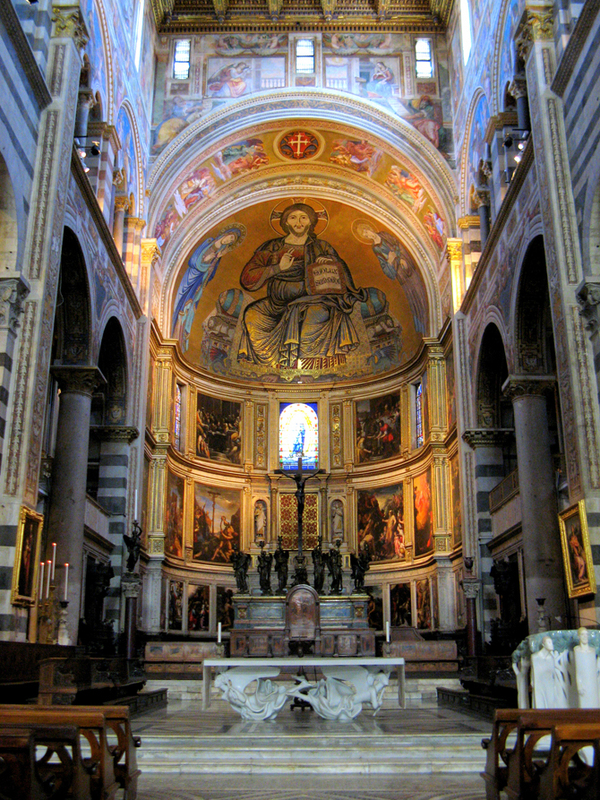 Unfortunately a terrible fire in 1594 destroyed many of the original works of art.The Apse contains the magnificent mosaic showing Christ in Majesty, holding a book quoting St John, chapter 8, verse 12 “Ego sum Lux Mundi” : the light of the world. To his left, the Virgin Mary, robed in a blue maphorion (a hooded tunic worn by widows) appeals to her son to show mercy to humanity, (in latin iconography: Mary the Advocate). We would usually expect to find the figure of St John the Baptist to the right of Christ, however in this mosaic the position is taken by the young St John the Evangelist, shown holding his gospel, with his naked feet reminding the viewer of his presence at the Crucifixion. The artists who worked on this wonderful mosaic have taken some unusual iconographic liberties in their work, which is especially unusual in a period when Christian art was heavily regulated by the canons of the Church. The principal part of the work was carried out in a short period of time by two groups of artists. Giovanni Cimabue was responsible for the head of St John. 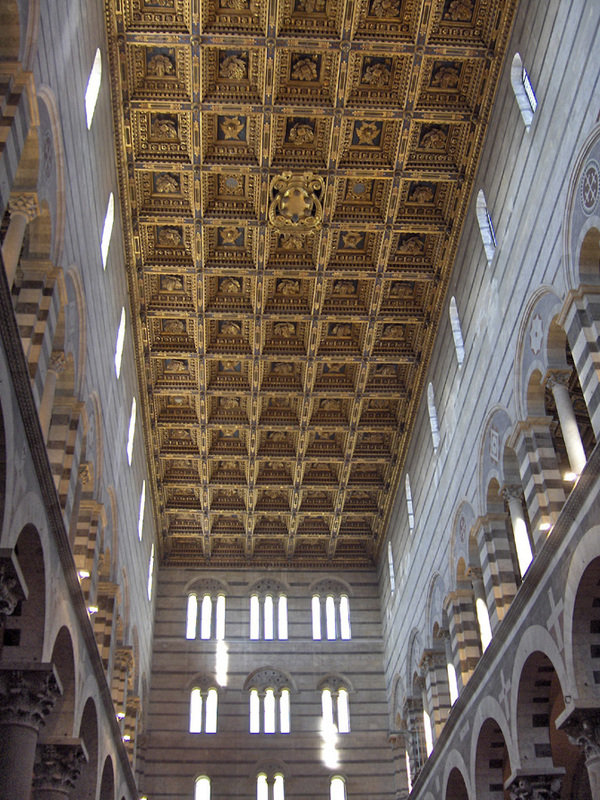 It was his last work which he finished in 1302 just before his death. Another nucleus of the liturgical life of the Cathedral of Pisa is the “Hodegetria”, an image of the Virgin Mary holding the infant Christ at her side pointing to him as the source of salvation for mankind. 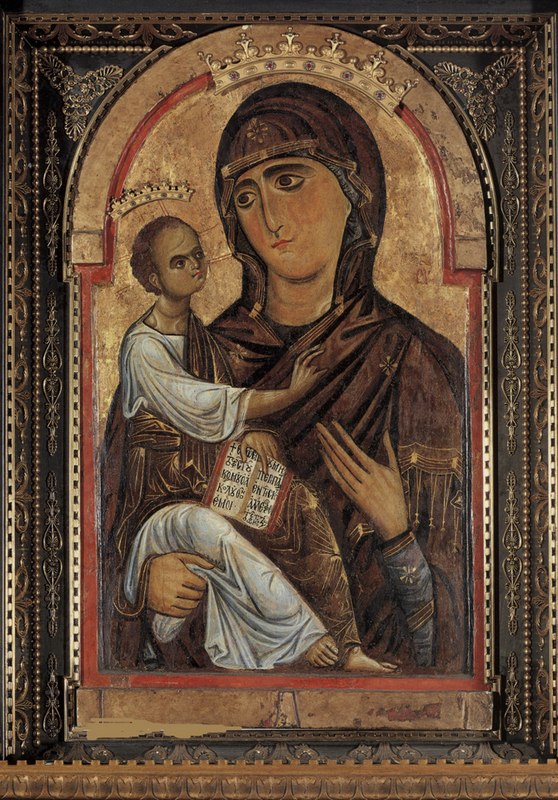 The origins of the icon are unclear: 16th century sources say the image was bought to Pisa after the war with Lucca in 1225, while others claim the icon was already in the possession of the local Uppezzinghi family. Some critics believe it it is the work of Berlinghiero Berlinghieri, based on an analysis of the colours, however the long Greek text in the book held by Christ makes this unlikely. 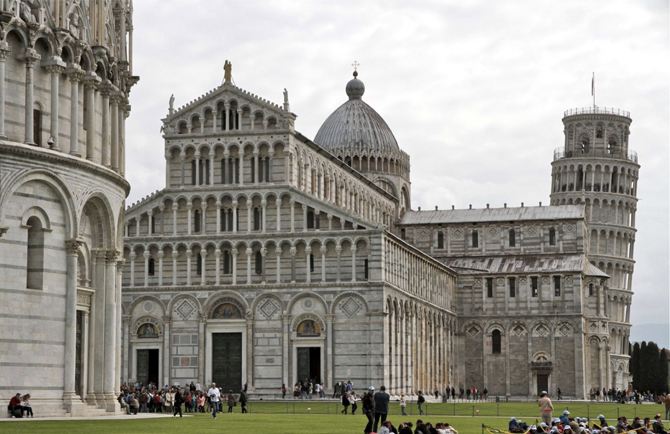 Whatever its origins we know that the icon was highly venerated in the mediaeval period and was considered by the people to be a protector of the city: Pròtege Virgo Pisas (The Virgin protectress of Pisa). 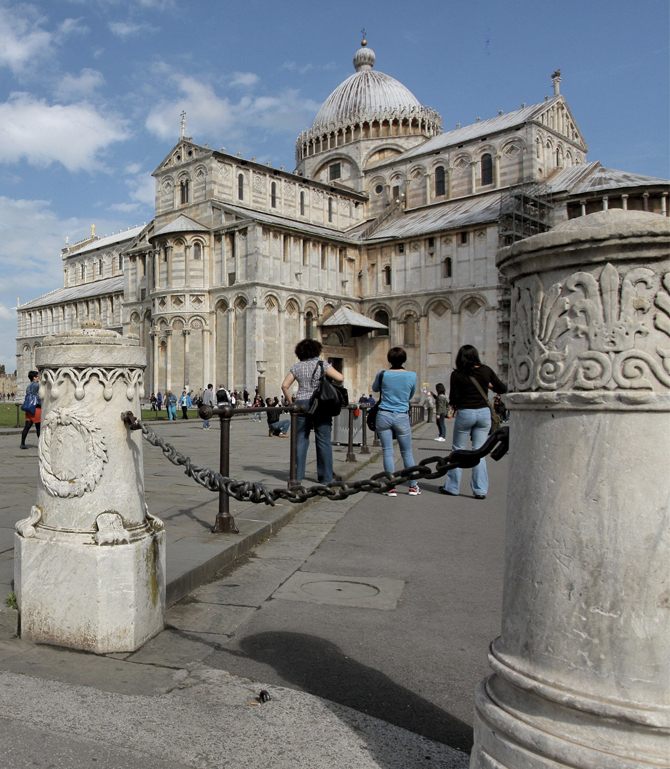 The cathedral also contains one of the masterpieces of Pisan sculpture. This is the elaborately carved pulpit by Giovanni Pisano who took his inspiration from classical sculpture. The pulpit was only rediscovered and placed in its current position in 1926. 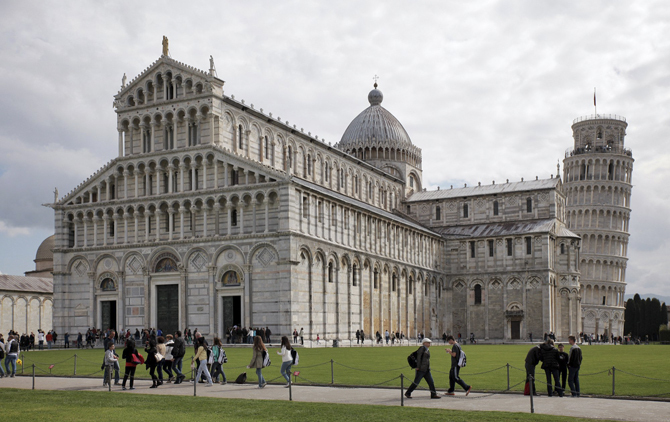 Share the post "The Cathedral of Pisa"